The ‘James’ Mountain Man is NZ’s toughest 1 day multisport race. Earlybird entry now open – save 20% until end of Jul. Entries limited to 300 across both Mountain Man races. The “James” Macpac Mountainman is an R18+ Open range event – there are no age group categories! Race start 6:00am start with briefing at 5:45am. Competitors will be able to camp onsite at Lake Tennyson – there will be strict DoC rules in place. Briefing will be on the beach – be ready to start immediately after! Competitors can expect very hot conditions – be prepared and stay adequately hydrated. There will be marshal stations at various points but this is remote country so all competitors will need to be self-sufficient i.e. you must carry enough food/liquid for a full day – all rivers & creeks should be ok to drink from directly. In considering this event you should reasonably expect to complete the swim/kayak stage in no more than TWO hours and the MTB/run stages in no more than SEVEN hours each – 16 hours, maximum allowable time will be 16 hours. You must start your last run lap by 7:30pm with race cut off at 10pm. 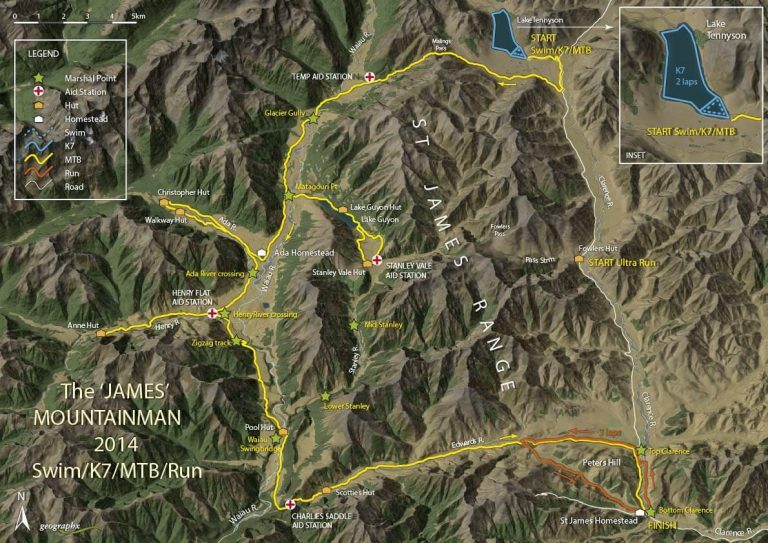 Check out this year’s times on the results page or if you’re not sure, the Yeti recommends you complete the “James” Epic and The “James” Stampede Ultra as individual events before taking on the Mountainman! The Swim stage is a 2km loop around the bottom (outlet end) of the lake and the Kayak stage will be 1.5 loops of the lake perimeter. While the mountain bike course is not significantly technical, it is a 100 km of off road 4×4 tracks and stock tracks whose surfaces vary greatly. Riders must be comfortable crossing rivers with their bikes as they will have 5 main river crossings and 7 smaller river crossings as well as various creeks. from the swim/kayak transition area riders will head out to the Top House road and head down to the Clarence bridge, after crossing the bridge they will turn right and follow the 4×4 track (think “Dual Single Track” – DST) to the top of Malings Pass, from where riders can enjoy a solid 5km downhill descent to the Waiau River. After completing transition, runners will start the 50 km high country run with the first (of 3) loop of the 17 km Alpine Adventure run. Leaving the transition runners will travel around below the St James Homestead to cross the Clarence River; from here they will run up the river valley following the old transmission tower access tracks up to the Edwards gate. While there will not be any compulsory gear to carry on the run stage, it is very strongly recommended that runner’s carry some form of hydration of 2l capacity or more! There will be a mini aid station at Bull Gully (at approximately the 14.5km mark). * times corrected based on final race format.